Get a free SugarSync account for the easy way to access and share your documents from all of your devices. Besides for SugarSync free storage space offers, this page also lists coupon codes, discount promotions, and other special deals for this service. We Geeks love to stay in sync. That requires us to be technologically connected wherever we may happen to be. Whether you’re an employee, employer, or self-employed, you’ll find that SugarSync provides a useful service that enables you to sync, backup, and share files. You can allow client access to any folder or subfolder, access files from your Blackberry or iPhone, and keep files in sync between your desktop and laptop. They offer file sharing for professionals, mobile apps for on-the-go techies, file backup for avid power users and for personal use, file syncing for education, and file sharing for business owners, among other services. Log on to www.sugarsync.com to find a plan that suits your individual synchronization or back up needs. 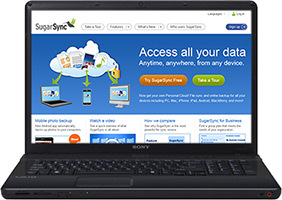 SugarSync.com automatically syncs your files to a cloud where you can access them from a wide variety of devices, ensuring that everything from your phone to your laptop to your desktop stay in sync. They have mobile apps for every device from iPad, iPhone, and Android to BlackBerry, Windows, Mobile, and Symbian. You get secure, continuous, and automatic online backup with true data security and protection. Sugar Sync enables you to gain remote access to your photos and music and to retrieve, share, and edit files of all types from virtually any device. Seamlessly share files of any size with friends, co-workers, or family members. This company provides a file syncing service that is powerful, flexible, and affordable. Take a tour on the SugarSync website to learn more about the company’s online backup, file sharing, and synchronization services. Click on over to the website’s blog for special offers, technological news, updates, and tips and tricks.